Jade is a greenish black to creamy white stone which is highly valued in China. However jade can rarely be found in blue or lavender colours. The translucent emerald green type known as jadeite-jade is the most prized variety. 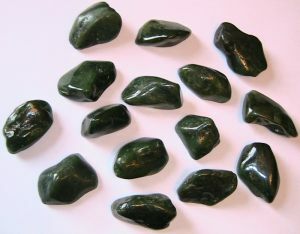 Different rocks such as nephrite, serpentine or green quartz have been erroneously marketed as Jade. Also known as "piedra de ijada" stone of the flank, as it was thought to cure kidney pains. Jade also strengthens the heart and the immune system, helps cleanse blood, increases longevity and fertility, aids eye disorders and female problems.Its subtle and smooth vibrations dispel negativity and radiate divine unconditional love, clarity, modesty, courage, justice and wisdom. It is a peaceful and nurturing stone. Jade is the Mystical Birthstone of the zodiac sign Aries and is also associated with the star sign Taurus. Modern thought links to the planet Venus.